I wonder how much it costs to get the old pre-digital/dot-matrix destination rolls re-done. Or indeed if there are many people who remember how to do it. ← Previous Previous post: Why are they surprised? This is why the tramways should do what the ABC does and use a generic name that will remain constant: “DOCKLANDS STADIUM”. That would negate any requirement to update signs. Let’s get the little things done first – like extending the tram lines further out. I thought the Etihad Stadium was not built when those trams were new. The stadium was first called colonial stadium. How did they change the name on the tram. I was about to say exactly what Adam said. I’m kinda surprised that–in contrast to the ABC–this public service was even allowed to acknowledge the vagaries of commercial stakeholders. Oh… wait. @Luke, disagree, I think @Adam’s hit the nail on the head. Spot on Adam- I’d say just about most of Melbourne probably refers to it as such anyway!! I hope that Yarra Trams (whatever the holding company) does a full cost/benefit analysis on any corporate naming rights at actual stops… If the company is not paying the transit agency to update maps, signage etc, then as Adam said, a generic but recognizable stop name should suffice, as later on-costs associated with any update may easily exceed any upfront payment. I guess we haven’t seen direct stop naming in Australia yet even using the corporate name as now in destination board seems to be giving (yet another) ‘intangible/externality’ freebie at the expense of the public purse, unless Docklands compensates the transit agency as part of its naming deals… rofl…. 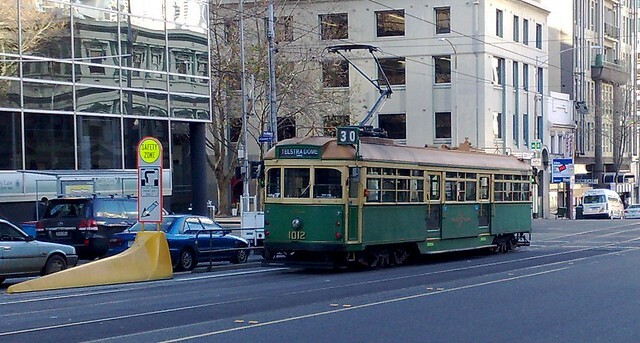 I wonder if any trams are going to “Southern Cross”? That is, the building on Exhibition St, not Spencer Street Station. What is Etihad, anyway? My immediate reaction was to reverse the letters, to see if they made sense that way. Dahite? Well, it’s more pronounceable. Etihad is the airline of Qatar. Or Abu Dahbi. Or Bahrein. One of those, anyhow. Its not from Dubai because thats where Emirates is from.